What does The Arc de Triomphe du Carrousel, the White House, The Jefferson Memorial, and The Robert Street Bridge all have in common? Upon initial glance, none of them look like the other. When inspecting their structures, however, we can see how each of them was influenced by roman architectural elements. Roman architects predominately used concrete and built temples, amphitheatres, monuments, bridges, drainage systems, and additional infrastructure which helped with the creation of new towns. Below we are taking a look at the influence of Roman architecture on some of the most popular tourist destinations of today. A triumphal arch such as The Arc de Triomphe du Carrousel, is believed to be one of the most distinctive types of architecture associated with ancient Rome. While the arch was constructed to commemmorate Napoleaon's military victories, it is a close imitation of the Arch of Septimius Severus in Rome. Architect Daniel Burnham designed Union Station using elements from Greek and Roman architecture. The Station's edifice which features columns, statues, and a triumphal structure, was confirmed to be modelled after the Arch of Constantine in Rome. Place Vendôme features a monumental free-standing column in the middle of the building which was influenced by the column of Trajan. The statue of Napoeleon that rests at the top was even dressed in the style of a Roman emperor. The Robert Street Bridge features eight reinfoced-concrete arch main spans and nine prestressed-concrete-beam approach spans. While the urban location of the bridge called for a more Moderne style architectural detailing, the use of the arches to support the structure is reminiscent of Roman architecture. The Roman column design and arches on the exterior of the building strongly display the Roman influences on the White House. With the dome design and columns, The Jefferson Memorial has a striking resemblance to the Pantheon and can be accredited for being heavily influenced by Roman architecture. 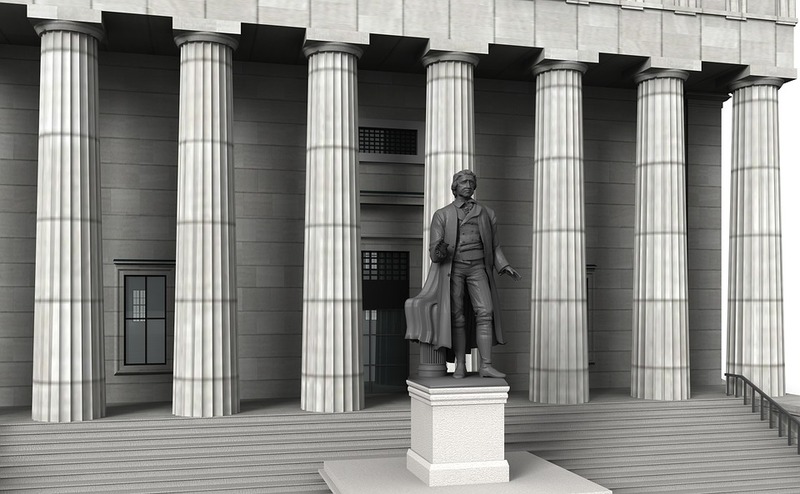 The Federal Hall located in New York City features Doric columns at the entrance of the building. These columns are fluted without any decoration on the top and are flush with the floor. The Courthouse in Delaware County features Ionic columns which are constructed with a stone that is curled at the top to resemble a scroll and a small square base at the bottom. While the Ionic column is a distinct order in Ancient Greek architecture, the Romans adopted the columns and these adaptations are what we commonly see today. Feeling inspired to add columns into your next design? Browse the selection of columns on CADdetails.com.